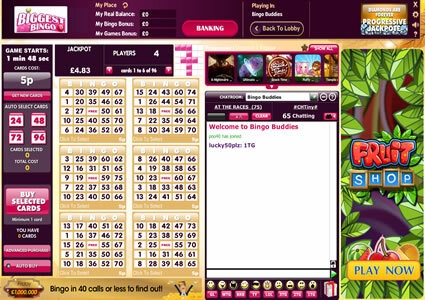 Biggest Bingo is a very good internet bingo site and there are lots of games to choose from here on a site using the 888Holdings/Globalcom bingo software. 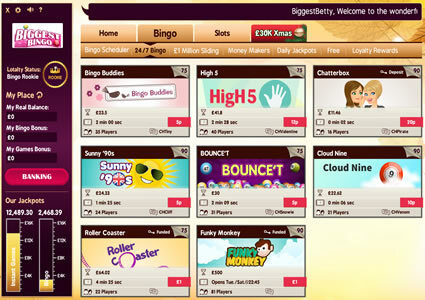 Biggest Bingo is part of a big network of sites which brings a whole host of benefits to the internet bingo player. 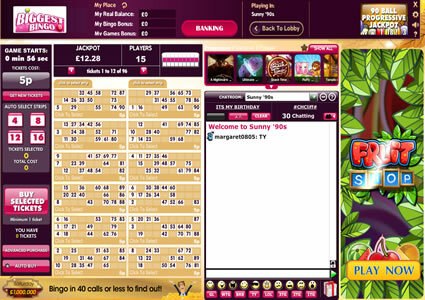 You will find an array of bingo rooms to play in; some host 75 ball and others 90 ball. The other rooms are for pre-buying your bingo tickets for the big games available at Biggest Bingo as well as free bingo and all can be found in the lobby under the appropriate tabs. Some of the 75 ball bingo rooms are reserved for bingo players who have actually made a deposit but as a new player you can access the other rooms that are available..
Biggest Bingo offers some great cash prizes in their bingo rooms with coverall jackpots playing regularly at their internet bingo site including the big £1 million coverall games three times a week. Progressive jackpots are also on offer in both their 75 and 90 ball bingo rooms and the site also boasts some great side games for you to enjoy without interruption to your internet bingo games. 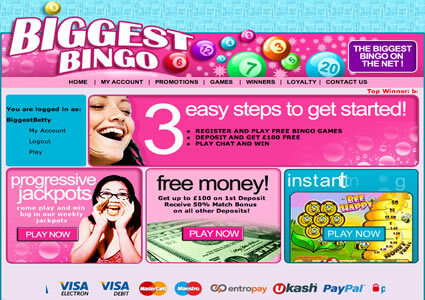 This brand has a really simple registration process and within seconds you’ll be ready to play at Biggest Bingo. Navigation around their site was very simple and easy to do with access to all the different areas of the site available from the main menu. This site has a great loyalty scheme running for its members and it is very easy to get involved in their online community and enter into their great Team Bingo games, which are a really good way to make lots of new friends. Whether you male or female you will find the graphics and software used are really cool! Don’t take our word for it, check them out for yourself! Biggest Bingo has the same game options as the other online bingo sites on the 888 Holding network and it’s all about how you like your game of bingo to play. Some people prefer to have their best card showing first but if you choose to manually dab your bingo cards this option is not available, it only works on the auto dab setting, the same can be said of the card sorting option. Although they don’t give you the option to change your dabber colour like some online bingo sites do it doesn’t take anything away from the game play. The 75 ball progressive jackpot comes into play on the “Diamonds are Forever” pattern and to win you need to call bingo in 35 bingo numbers or less. The games play from 6.15pm daily in Chatterbox and they play until 11.45pm every half an hour. The 90 ball progressive plays on every 90 ball bingo game and you simply need to call bingo on full house in 40 bingo calls or less. Coveralls run daily and a full schedule of prize money and times played is available by visiting Biggest Bingo. You won’t ever be short of choices when it comes to playing side games here as they offer almost 100 different variations of instant win games including slots and scratch cards.